We’ve been down in sunny Arizona for about a month now and the temperature has been breaking into the 100s (40’C) quite often. Granted I love the heat, but my pale white skin does not appreciate the blazing sunshine. So what should I do when my skin gets fried? 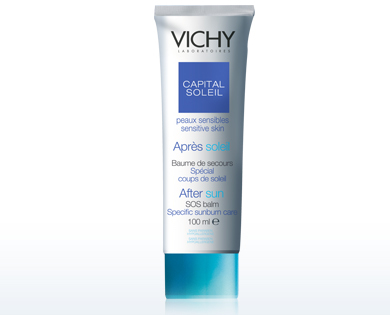 Reach for Vichy Capital Soleil After Sun SOS Balm ($25), of course. According to beautygeeks, “It contains an instant-soothe extract and a lipid-rich concentrate that helps skin regain its equilibrium so it can begin to heal. I promise you, this stuff will take the sting and redness away in a flash so your skin can think about forgiving you”.